Environmental destruction caused by climate change is not a matter of concern only for certain experts or people living in a certain region. It has become a critical issue that we all have to care about. 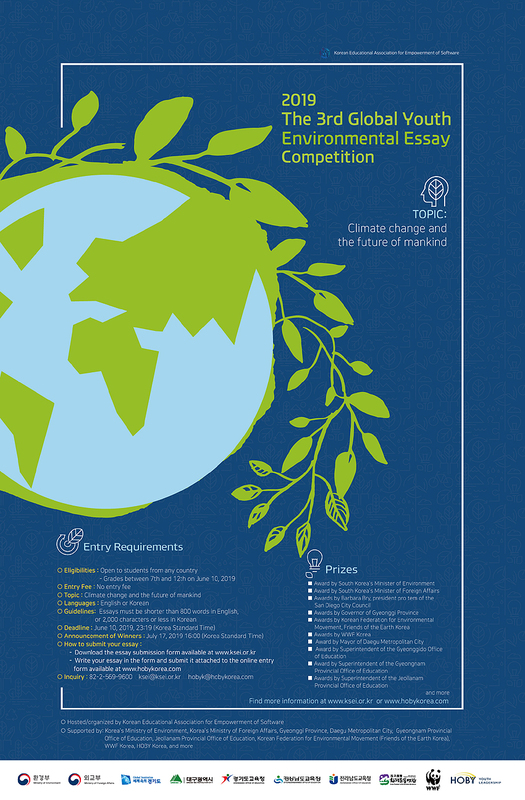 Following the successful hosting in 2014 and 2018, Korean Educational Association for Empowerment of Software is hosting the 3rd Global Youth Environmental Essay Competition in 2019 on the topic, “Climate change and the future of mankind,” to continuously urge youth to pay attention to the threat of climate change. Korean Educational Association for Empowerment of Software is a non-profit organization registered in the Ministry of Science and ICT in the Republic of Korea. We are committed to developing high skilled manpower and encouraging international exchange in the field of science and ICT, and giving youth a variety of opportunities to build skills, experiences and global awareness in various fields with leadership and innovation. ※ Submitted essays will not be returned. ※ Korean Educational Association for Empowerment of Software will obtain the copyright for submitted essays. ※ Essays must be written by one person.